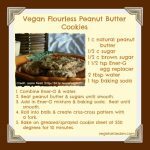 Today we’re celebrating Peanut Butter Cookie Day by sharing a terrific recipe for flourless peanut butter cookies. Yep, I said flourless! Sounds weird, I know, but removing the flour actually makes these cookies super light and delicate. 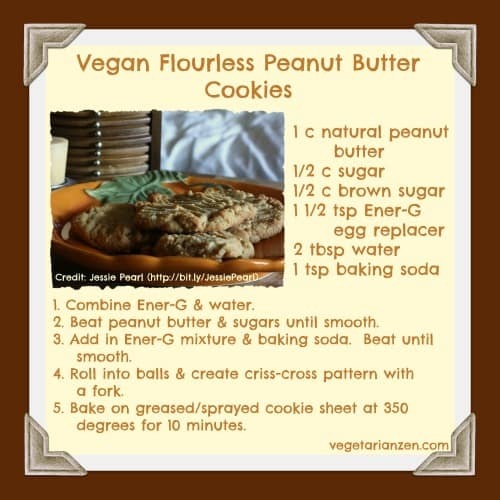 I made this recipe vegan by using Ener-G Egg Replacer , but you can easily substitute one egg in place of the Ener-G and water. My challenge to you, my cookie-eating friends, is to whip up a batch of these amazing peanut-buttery treats right now and enjoy them before Peanut Butter Cookie Day passes you by! Spray cookie sheets with non-stick spray. Combine Ener-G egg replacer and water; set aside until ready to use. Combine peanut butter and sugars; beat until smooth. Add Ener-G mixture and baking soda; beat until smooth. Roll dough into 2-inch balls and place on cookie sheet. Use a fork to flatten each ball and create a criss-cross pattern. Bake for 10 minutes, until cookies are set and lightly browned. Carefully remove cookies from sheet to a rack. Cool completely.